Usually typewriters in (American) films of the thirties and forties are readily recognised as common (American) machines. 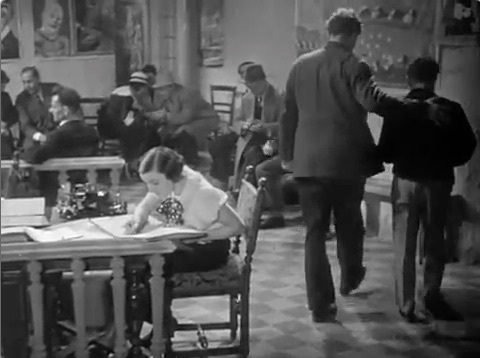 In this scene from the (German) movie 'Ein Lied Geht Um Die Welt', a slightly less common (German) typewriter can be seen. It is used by the secretary at the theatrical agent's office, sitting on her table. It's fairly small in the image, but it is clearly the distinctive profile of an Adler thrust-typewriter. Still gleaming and shiny, it may be an Adler 7. The pair walking away from the camera are the main characters of the film - two friends, a clown and a singer. The tall one is the clown, the diminutive figure is the singer. 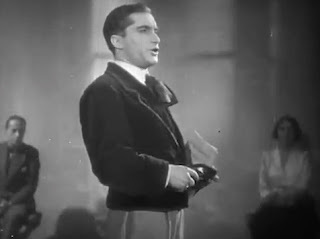 Despite his small stature, Joseph Schmidt had quite a voice! As witnessed from the record(s) found over the past couple of weeks. Interesting. I just read up on Schmidt a little. He was apparently called the "pocket Caruso" due to his short stature. Nice sighting. Its always pleasing when music and typewriter interests align.